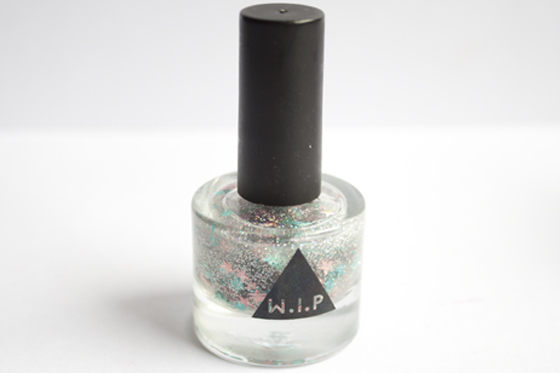 Glitter polishes with shaped glitter in are really hard to come by in the UK. In the ever growing need to feed my addiction to glitter nail polishes I knew I just had to purchase this when I saw it in store a few weeks back. Urban Outfitters Twinkle is a clear glitter polishes with tiny particles of holographic glitter and then loaded with star pink and teal. I find the best way to apply this polish is to swipe on the glitter and then go over it again dabbing on the individual stars, the polish is full of them so it's not too hard to grab them. The stars are quite stiff so don't sit completely flat on the nail, so I find I need to seal them in with a top coat. I have to admit they don't last overly long, Two days before they start to fall off as they natural get caught on clothing and are way too tempting to pick off. However I think they look amazing, especially layered over my ol' favourite Models Own Utopia. I'm unsure if the brand is called W.I.P. or they are just "Urban Outfitter Nail Polishes" so I'm calling them Urban Outfitters ones just for ease!